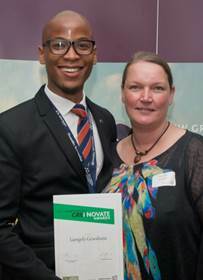 Alumnus Lungelo Gcwabaza, a Quantity Surveying Honours student, won third prize at the annual national Greenovate Awards Competition held recently. The competition is designed to inspire and encourage students of the built environment to discover, explore and invent ways to live more sustainably. Lungelo presented his BSc Quantity Surveying Honours research entitled: “The silent killers of strategy implementation in quantity surveying firms” at the competition (Supervised by Prof Gerrit Crafford). National Diploma in Graphic Design graduate, Clive Botha has been accepted into the ranks of the British Guild of Motoring Artists. It is a prestigioua worldwide group of artists, designers and engineers, founded in 1986, who share a common interest in automotive art and whose work shows strong commitment to motoring subjects. Botha has over 10 years experience, managing his own digital marketing agency, MotorMedia Communications, where he primarily focuses on automotive relative industries.